This will be my second summer as a mommy, but my first summer with a child that’s mobile. On warm days, I’ve already started taking Baby J to the park. He’s usually the youngest baby cruising around the jungle gym (closely supervised, of course), but he loves it! We’ve already purchased a couple of swim diapers, sun block, swim socks, and a hat for the pool. Until recently, I’d been under the impression sunglasses were actually bad for kids, so I had no intention of getting a pair for Baby J. Then I found out it’s the cheap, toy kind that are actually bad for kids and high-quality sunglasses are just as important as sunblock for babies and kids. Wearing bad-quality sunglasses is worse than wearing no sunglasses at all. Poor-quality sunglasses cause baby and kids’ pupils to dilate, letting in even more light, without any UVA and UVB ray protection. Once I’d decided I wanted to get a pair, I had no idea where to start. Shortly after my decision, the company Real Kids Shades contacted me about reviewing their baby sunglasses. Their timing was perfect, as you can see! Real Kids Shades sells quality sunglasses for babies and kids that are third-party tested to verify their 100% UVA/UVB protection. They’re also free of BPA, lead, and phthalates, as well as being CPSIA (Consumer Products Safety Improvement) compliant, CE certified, and FDA approved. They hold 6 US and 2 Australian patents and can be worn year around, under ski helmets, bike helmets, etc. Real Kids Shades sent me two pairs of sunglasses to review along with some pamphlets about selecting the right sunglasses for my child, and information about Star Pupils– a partnership between Prevent Blindness American and Real Kids Shades. I received a pair of My First Shades in the Green Frogs print for ages 2-5 and a pair of Extreme Element sunglasses in Navy for ages 3-7. Real Kids Shades has a size chart for each pair of shades, so you can figure out which size to choose by measuring your child’s head and referencing the chart. The My First Shades for ages 0-24 months adjusts by velcro from 41 to 47cm. Baby J’s head is about 47cm already (he’s almost a year old), so I asked for the next size up. The 2-5 year old shades adjust from 48-54cm, so they’re a little big for him. I can’t win! 🙂 Baby J can still wear the 2-5 though. They have a nice fit around the eyes and face, but the band sits right on top of his little ears. The Extreme Element pair are a little too big for him to wear now, so I put them away for later. Update: I gave away the Extreme Element pair to my 4-year old nephew who loves them! He calls them his “goggles” and wears them under his bike helmet outside and on his head indoors. Both pairs of sunglasses are very cute and made with professional-grade polycarbonate frames and lenses. The wide neoprene bands have foam padding and feel very soft and comfortable. The lenses on both are shatter proof and impact resistant. I think that’s important for active little ones! The My First Shades can actually be fitted with prescription lenses, which I thought was pretty neat. The My First Shades line was designed with help from a pediatric ophthalmologist. Both My First Shades and Extreme Elements are waterproof and rust proof with a wrap-around style. This keeps the shades around Baby J’s eyes and minimizes damaging peripheral light. I knew getting Baby J to wear sunglasses would be a challenge. It took him just a couple of tries to get used to his hat, because I took him out in the sun and helped him make the correlation that the hat blocks the sun. I figured I’d do the same with the sunglasses. The first time, it still didn’t go that well. He immediately wanted to rip them off. The second day that I tried, I made a point of putting the sunglasses on and off to show him the difference with the sun. He left them on…well…maybe about a minute before trying to take them off. The third time I tried, I did the same as before, but I also put the sunglasses up against my eyes as well, so he could see me “wearing” them. After that, he wore them for a couple of minutes before starting to pull them down. I think I’m finally seeing success! I also think part of the problem is that the band is bothering him, because it’s too low. There’s nothing I can do about that, except wait for him to grow into them. I’m going to keep trying, and I know that eventually he will get used to them. Consistency is key. I’m very pleased with these sunglasses. They seem comfortable and well-made. Most of the Real Kids Shades sunglasses retail at $14.99 a pair. I think that’s a very reasonable price for high-quality baby and child sunglasses. 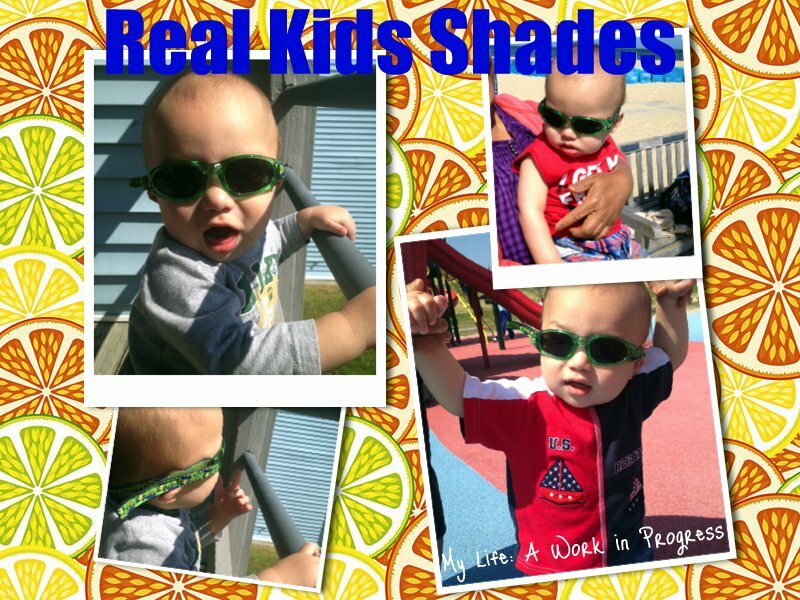 Visit Real Kids Shades for more information and to purchase. Find them on Facebook and Twitter for updates and giveaways! Click HERE to go to the giveaway. Note: I received two pairs of Real Kids Shades for review purposes. I was not otherwise compensated for this post. The opinions expressed above are mine and may differ from yours. Like my review? Please vote for me at Top Mommy Blogs and Picket Fence! Just click HERE and HERE. Thanks! Oliver has some very similar to these. I have a hard time getting him to keep them on. But when he has, they’re great! Yeah, keeping them on is the key, hahah! But we’ll get there eventually. I need these for my baby, she doesn’t like to wear anything on her head/face. These are so cute! I love you can choose between the all around band or not having that and love the variety or colors and prints! 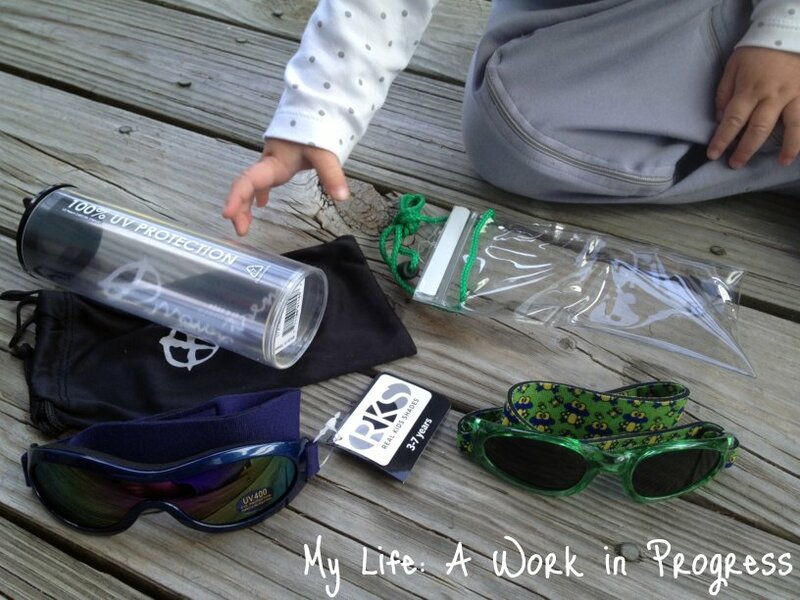 My kids us our cheap sunglasses that we’ve accumulated from running races or baseball games. Definitely need to invest in good eyewear. My niece and nephew will love these. Thanks for sharing. These are adorable! I didn’t know they were free of BPA, lead, and phthalates. That is very good to know! This is great for babies/kids to have to protect their eyes in the sun. The little boy looks adorable in the photos! He knows he’s cool. Great post, and the glasses are so cute! Important for the kids to learn to wear them for their eyes to be protected, these are great! they’re shatterproof! thats amazing. i always worry about a toddler with eye wear! I love that these are 100% UVA/UVB protected, free of BPA, lead, and phthalates, as well as being CPSIA (Consumer Products Safety Improvement) compliant, CE certified, and FDA approved. Would definitely love to try them!